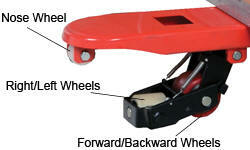 Transport long loads down narrow aisles with this heavy-duty Sidewinder Pallet Truck, model SW-PJ. 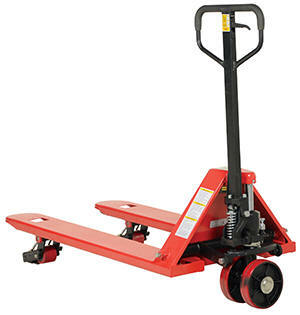 This versatile Pallet Truck retains all the quality workmanship of a standard pallet truck in addition to providing lateral movement. 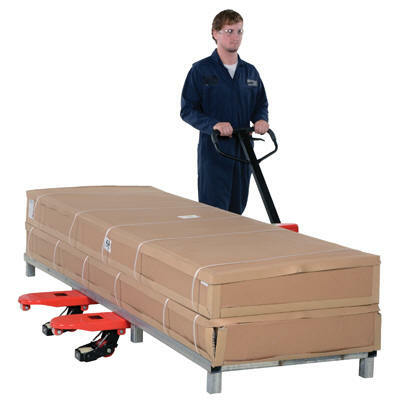 Simply place the forks into the pallet then elevate to approximately seven inches, rotate handle, and lock detent into place. The second set of rollers, right/left, are actuated. Now push the Side Winder perpendicular to the traditional direction.